Of all the characters on Game of Thrones, none has evolved more over the past seven seasons than Sansa Stark. We've seen her grow from a spoiled little girl who was honestly kind of insufferable to a formidable politician and a total survivor. So it's with a heavy heart that we entertain the notion she might not make it to the end of Season 8. Here is every compelling theory we've found about Sansa's death, her possible pregnancy, and a few questions we need resolved — like are she and Tyrion still married? All men must die — but is Sansa's death coming sooner than we'd like? Unless you're new to this show, you're already pretty hardened and resigned to the fact that creator George R. R. Martin takes the literary advice "kill your darlings" a bit too seriously. After all, he killed off the ostensible hero of the series in the first book, and then there was the Red Wedding. It's definitely too much to ask that all our faves make it to the end of the series. Sansa's death is just as possible as anyone else's and there are a few possible clues that's where her storyline is heading. 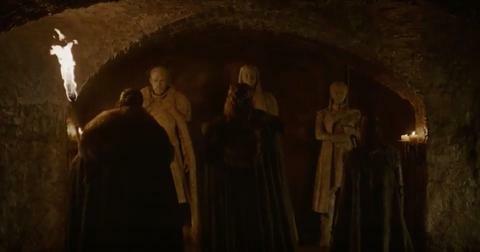 For one, there's this teaser showing three of the four surviving Starks in the family crypt, confronting their own graves. While this could mean all three will die, fans on reddit pointed out that Jon Snow looks quite a bit older than his current age in his, while Sansa and Arya each appear the age they are at present. They point to this as a premonition that both Stark girls will die before final credits, while Jon will live on to middle age. People on the Sansa Stark death train also point to an earlier teaser from January where Sansa tells Daenerys Targaryen, "Winterfell is yours, your grace." Unfortunately, that's not the first time someone has uttered this phrase in the series. 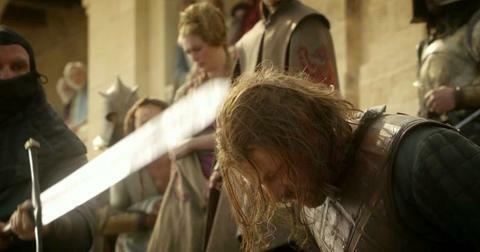 Ned said the same to Robert Baratheon and, well, we all know what happened to him. Another observant fan on reddit theorized that the fates of the Stark children have all been laid before us through the fates of their direwolves. Currently, the only direwolves still alive are Ghost and Nymeria, who belong to Jon and Arya, respectively. The user points out that Robb Stark was killed by Walder Frey and the Freys also killed his wolf, Grey Wind. 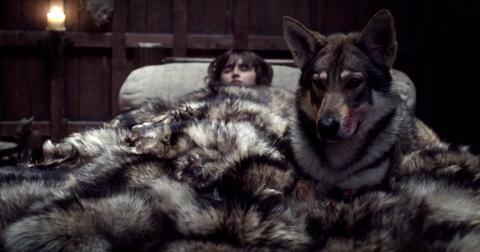 Similarly, Rickon and his pup, Shaggydog, were both killed by the Boltons. 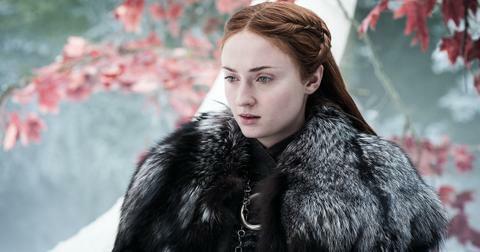 If the fates of the remaining Starks will mirror their wolves, that doesn't bode at all well for Sansa or Bran. Bran's wolf, Summer, sacrificed his life to the wights for Bran's, and it seems very likely Bran will do the same. Lady was killed by Ned, by order of Cersei and Robert Baratheon, in place of Nymeria, whom Arya chased away to save her from execution for biting Prince Joffrey. Nymeria has since been off in the Riverlands, far away from where direwolves typically dwell, which somewhat mirrors Arya's journey. Could Lady's fate mean Cersei will finally have Sansa executed for Joffrey's murder (even though she knows Olenna Tyrell did the deed)? Even if Sansa doesn't make it to the end of the series, some fans are convinced some part of her will. They posit that she was impregnated by Ramsay before he met his extremely timely end. The major reason people cling to this theory is that Ramsay told his bride, "I'm a part of you now." Plus, there was a photo still of Sansa where she looks to have a slight protrusion at her waist, but actress Sophie Turner points out "months and months have gone on and Sansa really hasn't developed a baby belly." 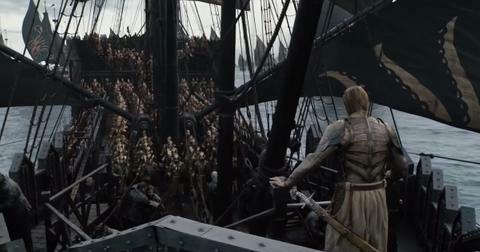 She argues that Ramsay meant the torture he put her through will live on in her mind. Anyway, it's probably a safe bet that she isn't pregnant — which is just as well. We already have one bombshell pregnancy to contend with in the final six episodes. Is she still married to Tyrion? Ramsay's death would seem to have left Sansa single and ready to mingle, though obviously the descent of the White Walkers from beyond the wall would probably put a damper on any possibility of a love life now. However, shrewd audiences will remember Ramsay wasn't her first husband, since Cersei forced her into marriage with her brother, Tyrion. 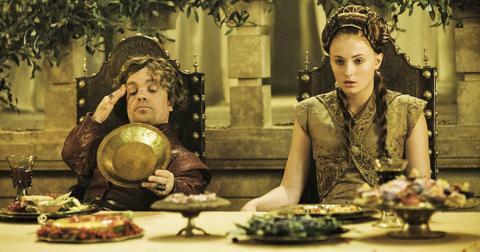 Ever the gentleman, Tyrion told his bride, "I won't share your bed. Not until you want me to," and Sansa was basically like, "OK, penciling you in for the 32nd of Neveruary." While I'm not an expert in marital law in the Seven Kingdoms, it's a safe bet that Petyr Baelish, aka Littlefinger, was. Before thrusting Sansa upon the Boltons, that the marriage was never consummated and therefore null. "By the law of the land, she's no man's wife." 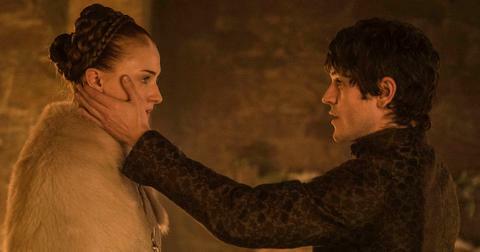 That said, there's no discounting the possibility of a reunion there when the Hand accompanies his queen to Winterfell. Season 8 of Game of Thrones premieres Sunday, April 14 at 9 p.m. on HBO.